The German Shepherd (German: Deutscher Schäferhund, German pronunciation: [ˈʃɛːfɐˌhʊnt]) is a breed of medium to large-sized working dog that originated in Germany. In the English language, the breed's officially recognized name is German Shepherd Dog (sometimes abbreviated as GSD). The breed was officially known as the Alsatian in Britain until 1977 when its name was changed back to German Shepherd. The German Shepherd is a relatively new breed of dog, with their origin dating to 1899. As part of the Herding Group, German Shepherds are working dogs developed originally for herding sheep. Since that time however, because of their strength, intelligence, trainability, and obedience, German Shepherds around the world are often the preferred breed for many types of work, including disability assistance, search-and-rescue, police and military roles, and acting. The German Shepherd is the second-most registered breed by the American Kennel Club and seventh-most registered breed by The Kennel Club in the United Kingdom. German Shepherd, female, medium-sized, shorthair, working type, dam. German Shepherds are medium to large-sized dogs. The breed standard height at the withers is 60–65 cm (24–26 in) for males, and 55–60 cm (22–24 in) for females. German Shepherds are longer than tall, with an ideal proportion of 10 to 8 1/2. The AKC official breed standard does not set a standard weight range. They have a domed forehead, a long square-cut muzzle with strong jaws and a black nose. The eyes are medium-sized and brown. The ears are large and stand erect, open at the front and parallel, but they often are pulled back during movement. A German Shepherd has a long neck, which is raised when excited and lowered when moving at a fast pace. The tail is bushy and reaches to the hock. German Shepherds have a two-layer coat which is close and dense with a thick undercoat. The coat is accepted in two variants; medium and long. The long-hair gene is recessive, making the long-hair variety rarer. Treatment of the long-hair variation differs across standards; they are accepted but not competed with standard coated dogs under the German and UK Kennel Clubs while they can compete with standard coated dogs, but are considered a fault in the American Kennel Club. The FCI accepted the long-haired type in 2010, listing it as the variety b—while short-haired type is listed as the variety a. Most commonly, German Shepherds are either tan/black or red/black. Most color varieties have black masks and black body markings which can range from a classic "saddle" to an over-all "blanket." Rarer color variations include the sable, pure-black, pure-white, liver, silver, blue, and panda varieties. The all-black and sable varieties are acceptable according to most standards; however, the blue and liver are considered to be serious faults and the all-white is grounds for instant disqualification from showing in conformation at All Breed and Specialty Shows. German Shepherds were bred specifically for their intelligence, a trait for which they are now famous. In the book The Intelligence of Dogs, author Stanley Coren ranked the breed third for intelligence, behind Border Collies and Poodles. He found that they had the ability to learn simple tasks after only five repetitions and obeyed the first command given 95% of the time. Coupled with their strength, this trait makes the breed desirable as police, guard and search and rescue dogs, as they are able to quickly learn various tasks and interpret instructions better than other breeds. German Shepherds are moderately active dogs and are described in breed standards as self assured. The breed is marked by a willingness to learn and an eagerness to have a purpose. They are curious, which makes them excellent guard dogs and suitable for search missions. They can become over protective of their family and territory, especially if not socialized correctly. They are not inclined to become immediate friends with strangers. German Shepherds are highly intelligent and obedient, as well as being protective of their owners. While an Australian report from 1999 provides statistics showing that German Shepherds are the breed third most likely to attack a person in some Australian locales, once their popularity is taken into account, the percentages of GSD attacks drops to 38th. According to the National Geographic Channel television show Dangerous Encounters, the bite of a German Shepherd has a force of over 1,060 newtons (238 lbf) (compared with that of a Rottweiler, over 1,180–1,460 newtons (265–328 lbf), a Pit bull, 1,050 newtons (235 lbf), a Labrador Retriever, of approximately 1,000 newtons (230 lbf), or a human, of approximately 380 newtons (86 lbf)). 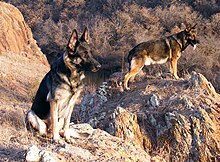 The modern German Shepherd breed is criticized by some for straying away from Max von Stephanitz's original ideology that German Shepherds should be bred primarily as working dogs and that breeding should be strictly controlled to eliminate defects quickly. He believed that, above all else, German Shepherds should be bred for intelligence and working ability. The Kennel Club, in the United Kingdom, is involved in a dispute with German Shepherd breed clubs about the issue of soundness in the show-strain of the breed. The show-strains have been bred with an extremely sloping topline (back) that causes poor gait in the hind legs. Working-pedigree lines, such as those in common use as service dogs, generally retain the traditional straight back of the breed. The debate was catalyzed when the issue was raised in the BBC documentary, Pedigree Dogs Exposed, which said that critics of the breed describe it as "half dog, half frog". An orthopedic vet remarked on footage of dogs in a show ring that they were "not normal". The Kennel Club's position is that "this issue of soundness is not a simple difference of opinion, it is the fundamental issue of the breed's essential conformation and movement." The Kennel Club has decided to retrain judges to penalize dogs suffering these problems. The Kennel Club also recommends testing for haemophilia and hip dysplasia, other common problems with the breed. German Shepherds are a popular selection for use as working dogs. They are known for being easy to train and good for performing tasks and following instructions. They are especially well known for their police work, being used for tracking criminals, patrolling troubled areas and detection and holding of suspects. Additionally, thousands of German Shepherds have been used by the military. Usually trained for scout duty, they are used to warn soldiers to the presence of enemies or of booby traps or other hazards. German Shepherds have also been trained by military groups to parachute from aircraft or as anti-tank weapons. They were used in World War II as messenger dogs, rescue dogs and personal guard dogs. A number of these dogs were taken home by foreign servicemen, who were impressed by their intelligence. The German Shepherd is one of the most widely used breeds in a wide variety of scent-work roles. These include search and rescue, cadaver searching, narcotics detection, explosives detection, accelerant detection and mine detection dog, among others. They are suited for these lines of work because of their keen sense of smell and their ability to work regardless of distractions. At one time the German Shepherd was the breed chosen almost exclusively to be used as a guide dog for the visually impaired. When formal guide dog training began in Switzerland in the 1920s under the leadership of Dorothy Eustis, all of the dogs trained were German Shepherd females. An experiment in temperament testing of a group of Labrador Retrievers and German Shepherds showed that the Retrievers scored higher on average in emotional stability and ability to recover promptly from frightening situations, cooperative behavior and friendliness; while the German Shepherds were superior in aggression and defensive behavior. These results suggested that Labrador Retrievers were more suited to guide dog work while German Shepherds were more suited to police work. Currently, Labradors and Golden Retrievers are more widely used for this work, although there are still German Shepherds being trained. In 2013, about 15% of the dogs trained by Guide Dogs of America are German Shepherds, while the remainder are Labrador Retrievers and Golden Retrievers. The Guide Dogs for the Blind Association in the United Kingdom states that crosses between Golden Retrievers and Labrador Retrievers make the best guide dogs, although they also train some German Shepherds, as well as some other breeds. Guide Dogs for the Blind in the United States trains only Labrador Retrievers, Golden Retrievers and crosses between these breeds. Guide Dogs Queensland in Australia also trains only Labrador Retrievers and Golden Retrievers. German Shepherds are still used for herding and tending sheep grazing in meadows next to gardens and crop fields. They are expected to patrol the boundaries to keep sheep from trespassing and damaging the crops. In Germany and other places these skills are tested in utility dog trials also known as HGH (Herdengebrauchshund) herding utility dog trials. One Mexican German Shepherd, Zuyaqui, was dissected and his body put on display at the Sedena's "Narco Museum" in Mexico. He is regarded to be the dog who has captured the most drugs in Mexican police and military history. In 2018, a genetic study found that just prior to 1859 a broadly distributed European herding dog had given rise to the German Shepherd, the French Berger Picard, and the five Italian herding breeds: Bergamasco Shepherd, Cane Paratore, Lupino del Gigante, Pastore d'Oropa, and the Pastore della Lessinia e del Lagorai. In the 1800s northwest Europe (Belgium, Germany, Netherlands) the most common dog used to herd sheep and protect the homes was the so-called "continental shepherd dog". These dogs all looked very similar at that time, and it was around 1890 that the three breeds (Belgian Shepherd, German Shepherd and Dutch Shepherd) went their separate ways. Of those breeds, the Dutch shepherd looks closest to the continental shepherd of that time. During the 1850s, attempts were being made to standardize dog breeds. Dogs were being bred to preserve traits that assisted in their job of herding sheep and protecting their flocks from predators. In Germany this was practiced within local communities, where shepherds selected and bred dogs. It was recognized that the breed had the necessary skills for herding sheep, such as intelligence, speed, strength and keen senses of smell. The results were dogs that were able to do such things, but that differed significantly, both in appearance and ability, from one locality to another. To combat these differences, the Phylax Society was formed in 1891 with the intention of creating standardised development plans for native dog breeds in Germany. The society disbanded after only three years due to ongoing internal conflicts regarding the traits in dogs that the society should promote; some members believed dogs should be bred solely for working purposes, while others believed dogs should be bred also for appearance. While unsuccessful in their goal, the Phylax Society had inspired people to pursue standardising dog breeds independently. With the rise of large, industrialized cities in Germany, the predator population began to decline, rendering sheepdogs unnecessary. At the same time, the awareness of sheepdogs as a versatile, intelligent class of canine began to rise. Max von Stephanitz, an ex-cavalry captain and former student of the Berlin Veterinary College, was an ex-member of the Phylax Society who firmly believed dogs should be bred for working. He admired the intelligence, strength and ability of Germany's native sheepdogs, but could not find any one single breed that satisfied him as the perfect working dog. In 1899, Von Stephanitz was attending a dog show when he was shown a dog named Hektor Linksrhein. Hektor was the product of few generations of selective breeding and completely fulfilled what Von Stephanitz believed a working dog should be. He was pleased with the strength of the dog and was so taken by the animal's intelligence, loyalty and beauty, that he purchased him immediately. After purchasing the dog he changed his name to Horand von Grafrath and Von Stephanitz founded the Verein für Deutsche Schäferhunde (Society for the German Shepherd Dog). Horand was declared to be the first German Shepherd Dog and was the first dog added to the society's breed register. Horand became the center-point of the breeding programs and was bred with dogs belonging to other society members that displayed desirable traits and with dogs from Thuringia, Franconia and Wurttemberg. Fathering many pups, Horand's most successful was Hektor von Schwaben. 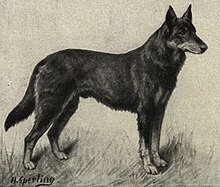 Hektor was inbred with another of Horand's offspring and produced Heinz von Starkenburg, Beowulf and Pilot, who later fathered a total of eighty-four pups, mostly through being inbred with Hektor's other offspring. This inbreeding was deemed necessary in order to fix the traits being sought in the breed. In the original German Shepherd studbook, Zuchtbuch für Deutsche Schäferhunde (SZ), within the two pages of entries from SZ No. 41 to SZ No. 76, there are four Wolf Crosses. Beowulf's progeny also were inbred and it is from these pups that all German Shepherds draw a genetic link. It is believed the society accomplished its goal mostly due to Von Stephanitz's strong, uncompromising leadership and he is therefore credited with being the creator of the German Shepherd Dog. Sable German Shepherds. Female (left), male (right). The breed was named Deutscher Schäferhund by von Stephanitz, literally translating to "German Shepherd Dog". The breed was so named due to its original purpose of assisting shepherds in herding and protecting sheep. At the time, all other herding dogs in Germany were referred to by this name; they thus became known as Altdeutsche Schäferhunde, or Old German Shepherd Dogs. The direct translation of the name was adopted for use in the official breed registry; however, at the conclusion of World War I, it was believed that the inclusion of the word "German" would harm the breed's popularity, due to the anti-German sentiment of the era. The breed was officially renamed by the UK Kennel Club to "Alsatian Wolf Dog", after the French region of Alsace bordering Germany. This name was also adopted by many other international kennel clubs. Eventually, the appendage "wolf dog" was dropped, after numerous campaigns by breeders who were worried that becoming known as a wolf-dog hybrid would affect the breed's popularity and legality. The name Alsatian remained for five decades, until 1977, when successful campaigns by dog enthusiasts pressured the British kennel clubs to allow the breed to be registered again as German Shepherds. The word "Alsatian" still appeared in parentheses as part of the formal breed name and was only removed in 2010. When the UK Kennel accepted registrations in 1919, 54 German Shepherds were registered. By 1926 this number had grown to over 8,000. The breed gained international recognition after the end of World War I. Returning soldiers spoke highly of the breed and animal actors Rin Tin Tin and Strongheart popularised the breed further. The first German Shepherd Dog registered in the United States was Queen of Switzerland. Her offspring suffered from defects as the result of poor breeding, which caused the breed to suffer a decline in popularity during the late 1920s. Popularity increased again after the German Shepherd Sieger Pfeffer von Bern became the 1937 and 1938 Grand Victor in American Kennel club dog shows, only to suffer another decline at the conclusion of World War II, due to anti-German sentiment. Popularity increased gradually until 1993, when they became the third most popular breed in the United States. As of 2016[update], the German Shepherd is the second most popular breed in the US. Additionally, the breed is typically among the most popular in other registries. The German Shepherd Dog's physique is very well suited to competing in shows and competitions, such as agility trials. Many common ailments of the German Shepherd are a result of the inbreeding practiced early in the breed's life. One such common ailment is hip and elbow dysplasia which may cause the dog to experience pain later on in life and may cause arthritis. A study conducted by the University of Zurich found that 45% of the police working dogs were affected by degenerative spinal stenosis, although a small sample size was used. The Orthopedic Foundation for Animals found that 19.1% of German Shepherd are affected by hip dysplasia. There are however ways to help prevent hip dysplasia. They include making sure you get them from a good breeder, keeping them on a healthy diet, and limiting the amount of jumping or rough play. Due to the large and open nature of their ears, German Shepherds are not prone to ear infections because there is no hair in the outer ear canal to hold debris or moisture. According to a recent survey in the UK, the median life span of German Shepherds is 10.95 years, which is normal for a dog of their size. Degenerative myelopathy, a neurological disease, occurs with enough regularity specifically in the breed to suggest that the breed is predisposed to it. A very inexpensive DNA saliva test is now available to screen for degenerative myelopathy. The test screens for the mutated gene that has been seen in dogs with degenerative myelopathy. A small study in the UK showed 16% of young asymptomatic GSDs to be homozygous for the mutation, with a further 38% being carriers. Now that a test is available the disease can be bred out of breeds with a high preponderance. The test is only recommended for predisposed breeds, but can be performed on DNA samples from any dog, collected through swabbing the inside of the animal's cheek with a sterile cotton swab. Prospective German Shepherd buyers can now request the test from the breeder or buy from a breeder that is known to test their dogs. Additionally, German Shepherds have a higher than normal incidence of Von Willebrand disease, a common inherited bleeding disorder, and exocrine pancreatic insufficiency (EPI), a degenerative disease of the pancreas. It is estimated that 1% of the UK GSD population suffers from this disease. Treatment is usually provided in the form of pancreatic supplements taken with food. Canine hip dysplasia (CHD) is an orthopedic condition resulting from abnormal development of the hip joint and surrounding tissue causing the instability and partial dislocation of the hip joint, resulting in pain, inflammation, lameness, and potentially osteoarthritis of the joint. German shepherds are genetically predisposed to CHD and the University of Veterinary Medicine in Germany found its prevalence estimated to be approximately 35% of veterinary cases associated with the disorder. Osteoarthritis is one of the main contributors of musculoskeletal pain and disabilities that commonly affect German shepherds. Mechanical stress, oxidative damage and inflammatory mediators combine to induce the gradual degeneration of the articular cartilage in the joint, resulting in reduced muscle mass, pain, and locomotion. It is essential to feed a well-balanced diet designed for large breeds like the German shepherd, to ensure adequate growth rates and proper maintenance of musculoskeletal health. Dietary energy levels should be monitored and controlled throughout all life stages and activity levels of the German shepherd to assist in the prevention and treatment of musculoskeletal disorder symptoms. Several dietary factors play a crucial role in maintaining skeletal health and are described as follows. Appropriate calcium levels are vital in developing a strong skeletal system and aid in preventing orthopaedic diseases like Canine Hip Dysplasia. Furthermore, the ratio of calcium and phosphorus must be balanced and at a recommended ratio of 1.2:1 to ensure proper bone development and structure. Imbalances in calcium and phosphorus levels can result in various skeletal complications. Excess phosphorus can produce lesions in bones whereas excessive calcium can lead to hypocalcaemia and result in excess bone deposition, interfering with normal bone development. In extreme circumstances of insufficient calcium intake, bone resorption can occur due to the body withdrawing calcium deposits from the skeletal frame as a last resort to fulfill dietary needs. Omega-3 fatty acids such as eicosapentaenoic acid (EPA) and docosahexaenoic acid (DHA), have been shown to be highly effective in the prevention of cartilage catabolism in in vitro models, suggesting that its supplementation in food could aid in decreasing the symptoms of osteoarthritis in German shepherds. Furthermore, EPA and DHA inhibit key regulators of the inflammatory process and suppress their activation which can help alleviate pain and reduce inflamed joints associated with many skeletal disorders. Ensuring an appropriate ratio of omega-3 to omega-6 fatty acids of approximately 5:1 is very important for inflammation processes. Animals source, specifically marine life such as fish, krill, and mussels, and plant sources such as flaxseed, soybean and canola oil, are particularly rich in omega-3 fatty acids. Glucosamine is an amino-monosaccharide that naturally occurs in all tissues, particularly in articular cartilage of joints and from the biosynthesis of glucose. Natural synthesis of glucosamine occurs in the extracellular matrix of articular cartilage in joints. However, as a result of damage to the joint or cartilage, there is decreased ability to synthesize glucosamine resulting in the deterioration of the joint, and supplementation is required. Clinical trials of long term administration of glucosamine in German Shepherds have reduced symptoms of degenerative joint disease and accelerated cartilage healing. Anti-inflammatory effects of glucosamine are believed to contribute to the reduction of pain, promote joint recovery and mobility, and prevent further cartilage degradation. Similarly, chondroitin supplementation is proposed to have comparable results in inhibiting degradative enzymes within the cartilage matrix to reduce the effects of osteoarthritis, but further research is required to assess long term benefits. Vitamins such as A and D also have crucial roles in bone development and maintenance by regulating bone and calcium metabolism. Adequate levels should be incorporated into a German shepherd diet to promote a healthy musculoskeletal system. German Shepherds have been featured in a wide range of media. In 1921 Strongheart became one of the earliest canine film stars, and was followed in 1922 by Rin Tin Tin, who is considered the most famous German Shepherd. Both have stars on the Hollywood Walk of Fame. German Shepherds were used in the popular Canadian series The Littlest Hobo. Batman's dog Ace the Bat-Hound appeared in the Batman comic books, initially in 1955, through 1964. Between 1964 and 2007, his appearances were sporadic. In the 1957 film Old Yeller, the rabid Great Plains wolf who infects the eponymous character isn't played by a wolf, but by a male German Shepherd. A German Shepherd named Inspector Rex is the star of an Austrian Police procedural drama program of the same name, which won many awards, where German Shepherd Rex assists the Vienna Kriminalpolizei homicide unit. The show was aired in many languages. At the beginning of the 2007 film Alvin and the Chipmunks, when the titular characters are wandering around in the crowded lobby of JETT Records, they are confronted by a blind man's German Shepherd guide dog. In the 2017 film A Dog's Purpose, a dog (voiced by Josh Gad), who was previously a retriever named Bailey, is reincarnated as a female German Shepherd police dog named Ellie. East-European Shepherd—A breed based on German Shepherd, specially developed in USSR for military, guarding or guiding. This breed is bigger than German Shepherd, having more straight topline and completely another coat which is more suitable for Siberian or even Arctic conditions. ^ a b c d e "USA German Shepherd Dog Standard". United Schutzhund Clubs of America. Archived from the original on 10 June 2008. ^ a b c d "GERMAN SHEPHERD DOG" (PDF). Fci.be. Retrieved 22 January 2018. ^ a b O'Neill et al., (2012). "Longevity of UK Dog Breeds" (PDF). Royal Veterinary College, University of London. Archived from the original (PDF) on 5 June 2013. Retrieved 18 January 2013. ^ a b c Coren, p. 134. ^ "AKC Dog Registration Statistics". Archived from the original on 7 February 2015. ^ "KC Dog Registration Statistics" (PDF). The Kennel Club. Retrieved 22 January 2018. ^ News, A. B. C. (28 October 2011). "Can the German Shepherd Be Saved?". ABC News. Retrieved 21 August 2018. ^ a b c "FCI Standard No 166". Australian National Kennel Council. 23 March 1991. Archived from the original on 15 February 2014. Retrieved 24 February 2013. ^ a b c d "German Shepherd Dog Breed Standard". American Kennel Club. Retrieved 15 July 2008. ^ "Rasse-Lexikon Deutscher Schäferhund" (in German). Verband für das Deutsche Hundewesen. Archived from the original on 25 August 2009. Retrieved 15 July 2008. ^ "GSD Info". Vonziü German Shepherds. Vonziü German Shepherds. Archived from the original on 6 November 2016. Retrieved 6 July 2017. ^ "Ranks 1 to 10 – Brightest Dogs". Petrix. Archived from the original on 15 July 2008. Retrieved 15 July 2008. ^ "The Top 10 Smartest Dog Breeds In The World". Pet Meds Online. Retrieved 15 July 2008. ^ "About the Breed". White Paws: German Shepherd. Archived from the original on 29 August 2008. Retrieved 15 July 2008. ^ "German Shepherd Dog and Puppy Training Tips from the German Shepherd Dog Club of America". www.gsdca.org. Retrieved 2018-03-02. ^ "Breed Standard — German Shepherd". New Zealand Kennel Club. Archived from the original on 20 July 2008. Retrieved 19 July 2008. While the dog should be approachable and friendly, he does not make immediate friendships with strangers. ^ "Reported Dog Attack Survey" (PDF). New South Wales Department of Local Government. 1999. Archived from the original (PDF) on 21 May 2009. Retrieved 18 November 2008. ^ "Council Reports of Dog Attacks in NSW 2011/2012" (PDF). New South Wales Department of Local Government. 2013. Retrieved 23 February 2017. ^ "Dog Bites: Information and Statistics". 26 January 2008. Retrieved 31 December 2012. Cites a National Geographic study. ^ The first standard of the German Shepherd Dog Society, written by von Stephanitz said, "A pleasing appearance is desirable, but it can not put the dog's working ability into question [...] German Shepherd breeding is working dog breeding, or it is not German Shepherd breeding" Harder, Aimee. "GSD vs. WGSD — It's not a black or white issue!". White German Shepherd Dog Club of America. Archived from the original on 9 May 2008. Retrieved 20 July 2008. ^ a b c d e f g h i j k l m n o p q r s Kern, pp. 11–21. ^ a b "German Shepherd Dogs – The Soundness Issue". The Kennel Club. 8 February 2010. Archived from the original on 1 May 2011. Retrieved 2 August 2011. ^ "KC confirms position on German Shepherds". ourdogs.co.uk. Our Dogs-UK. Retrieved 11 September 2015. ^ "German Shepherd Dogs – Judges Training Programme". The Kennel Club. 16 February 2010. Archived from the original on 19 October 2011. Retrieved 2 August 2011. ^ "GSD Breed Council - Haemophilia 'A' Testing". Gsdbreedcouncil.co.uk. Retrieved 29 October 2017. ^ "The Kennel Club - GSD Health Info". The Kennel Club. Retrieved 29 October 2017. ^ a b Strickland and Moses, p. 17–28. ^ "It's a dog's life in the Army". The New Zealand Herald. 22 July 2008. Retrieved 11 August 2008. ^ Ascarelli, Miriam (2010). Independent Vision: Dorothy Harrison Eustis and the Story of the Seeing Eye. West Lafayette, Indiana: Purdue University Press. ISBN 978-1-55753-563-4. ^ Case, Linda P. (2013). The Dog: Its Behavior, Nutrition, and Health. John Wiley & Sons. ISBN 978-1-118-70120-1. ^ "Breeds and Matching Process". An International Guiding Eyes Program. Guide Dogs of America. 2013. Archived from the original on 8 July 2010. Retrieved 21 July 2013. ^ "Our breeds". Guide Dogs for the Blind Association. 2013. Retrieved 21 March 2013. ^ "Guide Dog Breeding and Whelping". Dog Programs. Guide Dogs for the Blind. 2011. Retrieved 21 July 2013. ^ "Our Breeding Program". Guide Dogs. Guide Dogs Queensland. Retrieved 21 July 2013. ^ "Armas de Versace, rubíes y diamantes: el lujo de los narcos mexicanos". Eleconomista.es. Retrieved 22 January 2018. ^ Talenti, Andrea; Dreger, Dayna L; Frattini, Stefano; Polli, Michele; Marelli, Stefano; Harris, Alexander C; Liotta, Luigi; Cocco, Raffaella; Hogan, Andrew N; Bigi, Daniele; Caniglia, Romolo; Parker, Heidi G; Pagnacco, Giulio; Ostrander, Elaine A; Crepaldi, Paola (2018). "Studies of modern Italian dog populations reveal multiple patterns for domestic breed evolution". Ecology and Evolution. doi:10.1002/ece3.3842. ^ a b c d e "History of the Breed". German Shepherds.com. Archived from the original on 1 June 2008. ^ "Progency list for V Beowulf". Pedigree Database. Archived from the original on 10 February 2009. Retrieved 14 August 2008. ^ "Offspring of V Beowulf". Pedigree Online. 9 January 2018. ^ "German Shepherd — The Ultimate Service Dog". German Culture. Retrieved 15 July 2008. ^ "Change Of Name – German Shepherd Dog". The Kennel Club. 19 October 2010. Archived from the original on 27 October 2010. Retrieved 22 October 2010. ^ "AKC Dog Registration Statistics". American Kennel Club. Archived from the original on 11 May 2012. Retrieved 15 July 2008. ^ "German Shepherd Dog Health Problems". Dog Biz. Retrieved 19 July 2008. ^ Steffen, F.; Hunold, K.; Scharf, G.; Roos, M.; Flückiger, M. (2007). "A follow-up study of neurologic and radiographic findings in working German Shepherd Dogs with and without degenerative lumbosacral stenosis". Journal of the American Veterinary Medical Association. 231 (10): 1529–1533. doi:10.2460/javma.231.10.1529. PMID 18020994. ^ "Hip Dysplasia Statistics". Orthopedic Foundation for Animals. 2009. Archived from the original on 10 June 2009. ^ "Hip Dysplasia: Diagnosis - Treatment - Prevention". Animal Planet. 2012-05-15. Retrieved 2018-03-02. ^ Holder, A. L.; Price, J. A.; Adams, J. P.; Volk, H. A.; Catchpole, B. (2014). "A retrospective study of the prevalence of the canine degenerative myelopathy associated superoxide dismutase 1 mutation (SOD1:c.118G > A) in a referral population of German Shepherd dogs from the UK" (PDF). Canine Genetics and Epidemiology. 1: 10. doi:10.1186/2052-6687-1-10. ^ "Degenerative Myelopathy German Shepherd Dogs". University of Florida 1998. Archived from the original on 25 July 2008. Retrieved 11 April 2009. ^ "Von Willebrand's Disease (vWD): A Type of Hemophilia in Dogs". Drs. Foster & Smith, Inc. Retrieved 10 May 2009. ^ "Exocrine Pancreatic Insufficiency". Genetic welfare problems of companion animals. Archived from the original on 24 March 2014. Retrieved 20 March 2014. ^ a b c d e f g h i j k l m n Ackerman, N. 2008. Companion animal nutrition. Elsevier, 135-139. ^ Hand, M., Thatcher, C., Remillard, R., & Roudebush, P. 2000. Small animal clinical nutrition. Mark Morris Institue, 4: 542-543. ^ a b Peterson, S.G., Beyer, N., Hansen, M., Holm, L., Aagaard, P., Mackey, A. L., & Kjaer, M. 2011. Nonsteroidal anti-inflammatory drug or glucosamine reduced pain and improved muscle strength with resistance training in a randomized controlled trial of knee osteroarthritis patients. Archives of Physical Medicine and Rehabilitation, 92(8): 1185-1193. ^ a b Wenz, W., Hornung, C., Cramer, C., Schroeder, M., & Hoffmann, M. 2016. Effect of glucosamine sulfate on osteoarthritis in the cruciate-deficient canine model of osteoarthritis. Sage Journals, 8(2): 173-179. ^ a b c Buddhachat, K., Siengdee, P., Chomdej, S., Soontornvipart, K., & Nganvongpanit, K. 2017. Effects of different omega-3 sources, fish oil, krill oil, and green-lipped mussel against cytokine-mediated canine cartilage degradation. In Vitro Cellular & Developmental Biology – Animal, 53(5): 448-457. ^ Mehler, S., May, L., King, C., Harris,W., & Shah, Z. 2016. A prospective, randomized, double blind, placebo-controlled evaluation of the effects of eicosapentaenoic acid and docosahexaenoic acid on the clinical signs and erythrocyte membrane polyunsaturated fatty acid concentrations in dogs with osteoarthritis. Prostaglandins, Leukotrienes and Essential Fatty Acids (PLEFA), 109(1): 1-7. ^ "List of films with German Shepherds". Archived from the original on 16 February 2015. ^ "Ace the Bat-Hound appearances". Comics.org. Retrieved 15 September 2014. ^ "TV dog stars - Dogslife". www.dogslife.com.au. 17 October 2017. Retrieved 20 February 2018. Choron, Sandra (2005). Planet Dog: A Doglopedia. Houghton Mifflin Books. ISBN 0618517529. Coren, Stanley (1995). The Intelligence of Dogs: A Guide to the Thoughts, Emotions, and Inner Lives of our Canine Companions. New York: Bantam Books. ISBN 0553374524. Kern, Francis G. (1990). German Shepherds. Neptune City, New Jersey: T.F.H. Publications. pp. 11–21. ISBN 0-86622-865-9. Strickland, Winifred Gibson; Moses, James A. (1998). The German Shepherd Today. Howell Book House. ISBN 0-87605-154-9.
von Stephanitz, Max; Revised by Schwabacher, Joseph (1994). The German Shepherd Dog in Word and Picture. Hoflin Publishing Ltd. ISBN 978-99932-80-05-7. Willis, Malcolm B. (1976). The German Shepherd Dog: Its History, Development and Genetics. K and R Books. ISBN 0-903264-15-3. Brazil-Adelman, Dr. Mary Belle (2000). The German Shepherd Dog Handbook. Hauppauge, NY: Barron's Educational. ISBN 0-7641-1332-1. Cree, John (1977). Training the Alsatian, the Obedient Companion or Working Partner. Pelham. ISBN 0-7207-0993-8. "Extended Breed Standard of The German Shepherd Dog" (PDF). German Shepherd Dog Council of Australia in conjunction with Australian National Kennel Council. 26 March 2012 [3 February 2007]. Archived from the original (PDF) on 21 February 2014. Retrieved 10 February 2014. Harder, Aimee. "GSD vs. WGSD — It's not a black or white issue!". White German Shepherd Dog Club of America. Retrieved 8 February 2014. Hart, Ernest H. (1985). The German Shepherd Dog. New Jersey: T. F. H. ISBN 0-86622-031-3. Rice, Dan (1999). Training Your German Shepherd Dog. Hauppauge, NY: Barron's. ISBN 0-7641-0852-2. Stevens, Katrina (2002). The German Shepherd Dog. Willow Creek Press. ISBN 1-57223-512-8. "FCI Standard No 166 Translated by German Shepherd Dog Council of Australia". Australian National Kennel Council. 20 August 2013 [23 March 1991]. Archived from the original on 15 February 2014. Retrieved 10 February 2014. Wikimedia Commons has media related to German Shepherd Dog. "German Shepherd Dog" (Video). Dogs 101. Animal Planet.